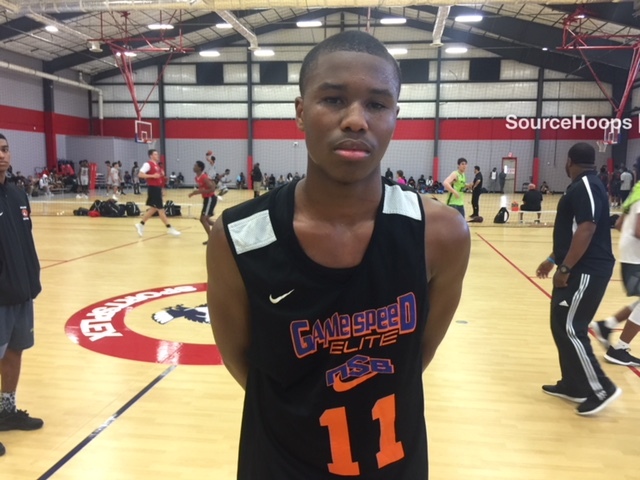 The Game Speed Elite program held a “pre-live” event at Orlando Christian Prep on Saturday for teams to get in one more competitive run before heading out to face competition in front of college coaches next week. More than a few players caught our attention. One of the main ones was 6’4 rising senior Rodney Rhoden from Team MOAM 17U. A product of Daytona Beach Mainland, Rhoden impressed with his ability as a playmaker and in the right system could be a tall point guard. He sees the floor well and delivers catchable passes to teammates at just the right time. Rhoden is a solid athlete and scores well at the rim. We didn’t get a look at his jumper; hopefully college coaches will find it acceptable next week. Playing for Skills Center Elite 16U, we were intrigued by physical tools possessed by 6’1 rising junior Tyreke James of Hillsborough. He was very fast up the floor and quick with the ball when attacking the defense. His reach and quick feet made him a challenging defender to get around. Offensively he was much more successful scoring on the break or on drives in the half-court. His jump shot has solid mechanics but failed to find its mark in the contest we watched. For Game Speed Elite’s 17U team, 6’4 rising senior Keeving Etienne had solid if quiet game. The Apopka product proved capable of scoring from the perimeter as well as at the basket in traffic. He’s a good athlete and helps out quite a bit in the rebounding department. Etienne is a quick leaper with length and blocked a couple of shots the opponents and crowd didn’t think he could get to. His physical traits should allow him to be a multi-position defender. He may be small, by Christian De Leon of Skills Center Elite 17U, produces in a big way. The Hillsborough rising senior stands 5’9 on a good day but his speed and ball skills allow him to get wherever he wants to go on the court. A one-man press break, De Leon routinely beat the defense down the floor and got open looks for himself or his teammates. On several occasions, he beat his defender and scored at the basket before help could arrive. Because he has been so successful at getting into the lane, his perimeter scoring skills are under-developed. Nate Louis of Team MOAM, a 6’4 rising senior from Apopka, was solid in his game on Saturday. More of a slasher than a shooter, Louis is a master at slithering through tight spaces and scoring around the basket. He also has a knack for grabbing and converting offensive rebounds. He plays big and can defend multiple positions. His jump shot is improving and he’ll connect from the perimeter given a bit of time and space. At 6’5, Game Speed Elite 17U rising senior Keenan Blackshear has lead guard abilities. On Saturday, he ran the point, handling the ball well against smaller, quicker defenders. Because of his size advantage, he sees the floor well and routinely finds open cutters. Blackshear is also able to slide over and play off the ball as either a “2” or “3”. When he does so, he is more successful driving the ball to the basket than attempting perimeter jumpers, something he needs to improve on. Khalil Shahhed, a 6’2 guard out of Georgia, now at Clearwater Superior Collegiate, played well for Thunderstruck 16U on Saturday. An athletic guard, he excels at getting to the basket and converts with excellent body control and touch. He’s also a pretty fair jump shooter off the catch. Defensively, he can be a stopper thanks to quick feet and a surly attitude at that end of the court. Playing for Central Florida Rising Stars 16U, 6’4 rising junior Ricardo Wright from Eustis, never strayed from attack mode. He handled the ball, ran the offense well, and went hard to the basket when the opportunity presented itself. While Wright connected on a sweet step-back three, nearly all of his points came at the rim or from the free throw line. He uncharacteristically struggled from the foul line, but his shot mechanics are such that his free throw difficulties should only be temporary. Alec Oglesby, a 6’4 wing out of Georgia, shot the ball quite well for Thunderstruck 16U. He has a quick release and gets a lot of back spin on the ball. He showed range well past the high school three point arc. Oblesby was also more than will to drive the ball hard to the basket if overplayed for the outside shot. When he did get into the lane, he converted at a high rate. Marlon Allen, a 6’5 forward for Team MOAM, is a guy coaches love to watch play. He goes hard every possession, is physically tough, and does a lot of little things to helps teams win. Allen is more of an opportunistic scorer, getting most of his points in transition, via offense rebounds, and quickly getting the ball up and in after cutting into the lane and receiving a quick pass.